Every year my family and I go on a fun vacation during the summer. 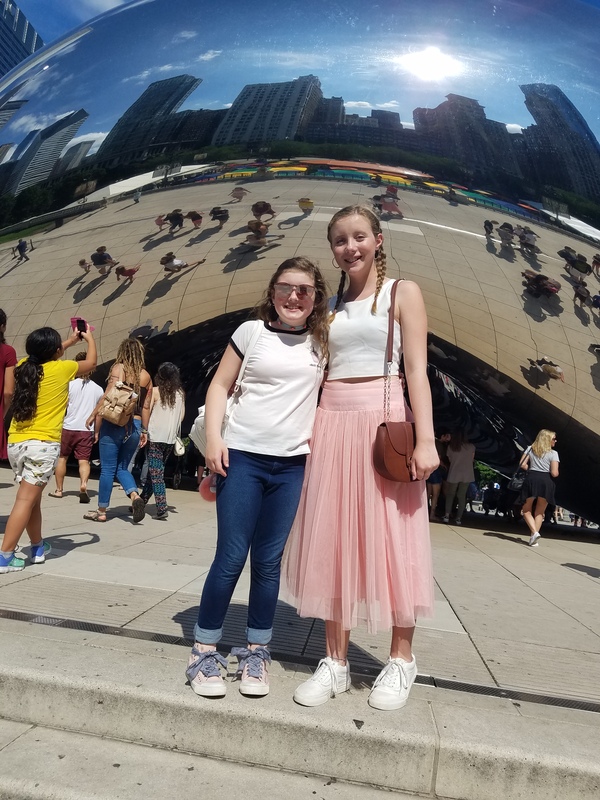 This year we traveled to St. Louis, Missouri and Chicago, Illinois. 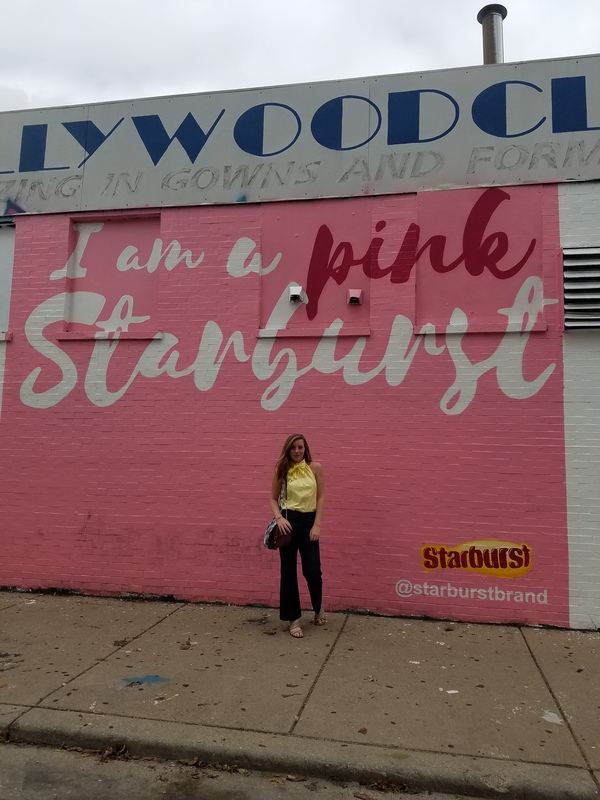 I adore reading about other people’s travels, so I decided to try my hand at travel blogging, even though I am in no way qualified to do that! 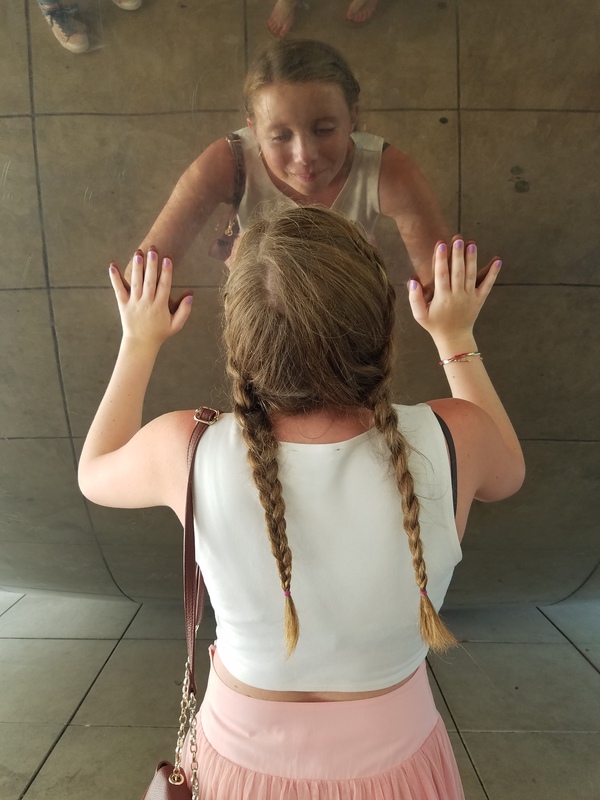 I’ve put together a Travel Diary of all the places we went during our stay in Chicago (a St. Louis Day in the Life is coming soon, so stay tuned). This post focuses on the main spots we visited, but I included bits about the lesser locations too. Keep reading and I hope you enjoy! After shopping on Michigan Avenue. 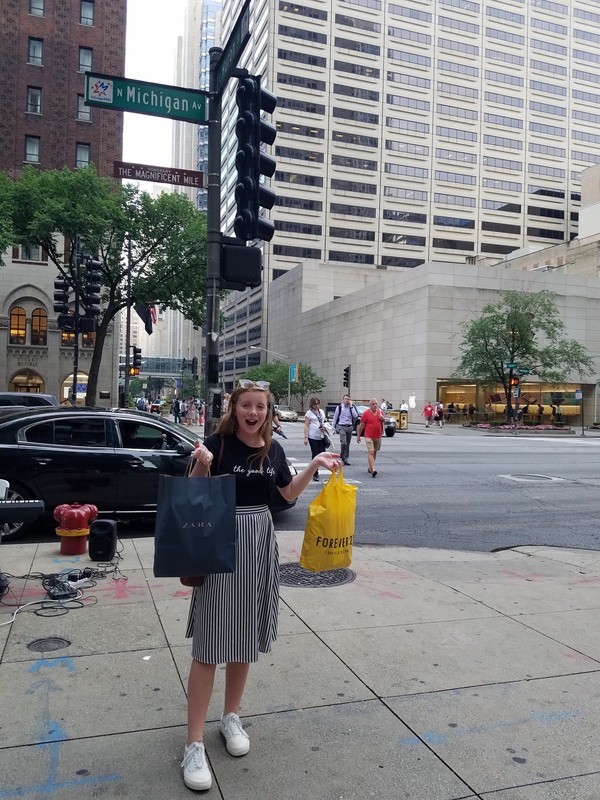 We arrived in Chicago from St. Louis early Wednesday, checked into our hotel, and dove right into the first part of our trip, The Magnificent Mile on Michigan Avenue. In other words, a shop-a-holic’s heaven! 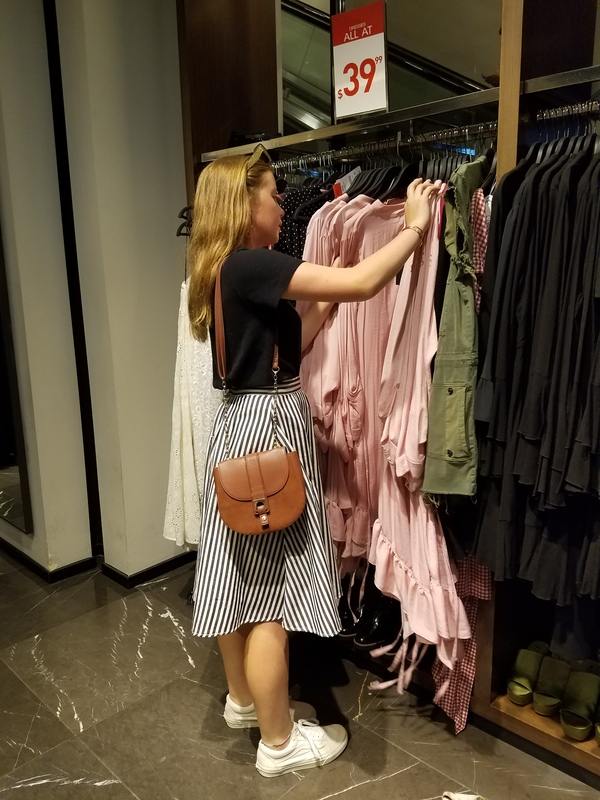 Stores from Zara, Nike, and Topshop to Burberry, Gucci, and Neiman Marcus line this busy Chicago street. There are even a few indoor malls that are several stories tall. Lots of shops were having fantastic sales and I couldn’t resist picking up some new pieces from Zara, Forever 21, H&M, and Ulta. Not a single thing I bought was over $35! *I did a mini-haul of everything I got over on my Instagram, @absolutelyolivia, so feel free to check it out. Once my fam and I were all shopped out for the day, it was off to Navy Pier for us. 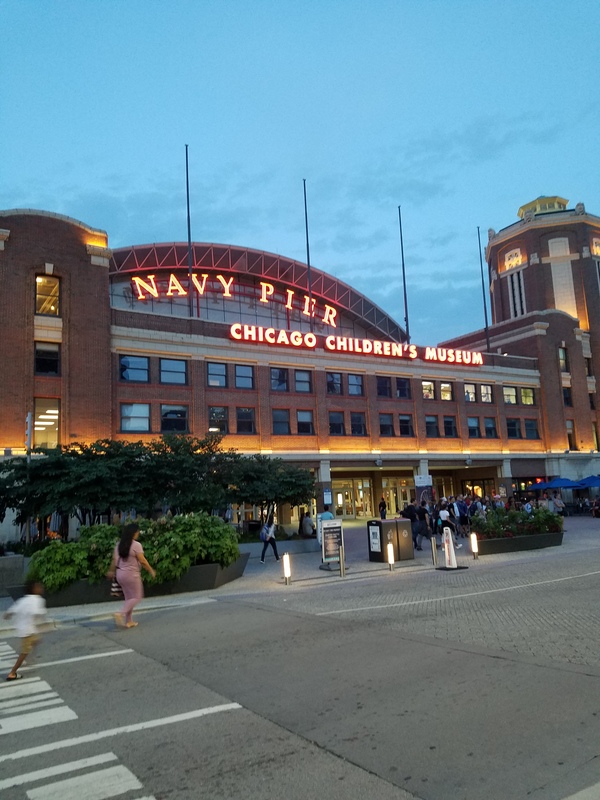 Navy Pier is a waterfront area on Lake Michigan with loads of yummy restaurants and amusement park rides, including a ferris wheel! After much debate, we settled Harry Carey’s for dinner and I’m so glad we did. 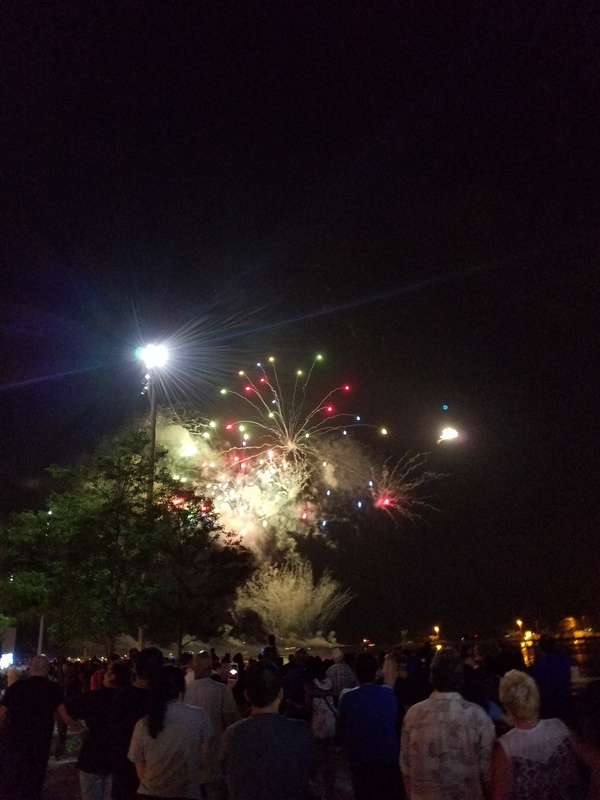 I had the most delicious black bean burger (my fellow vegetarians know how good these are :)) and to top the evening off there were fireworks above the water! One of the views from the boat. Even after a late night at the pier, our alarm was set for 7:30 am on Thursday because of a boat tour my fam and I were going on. 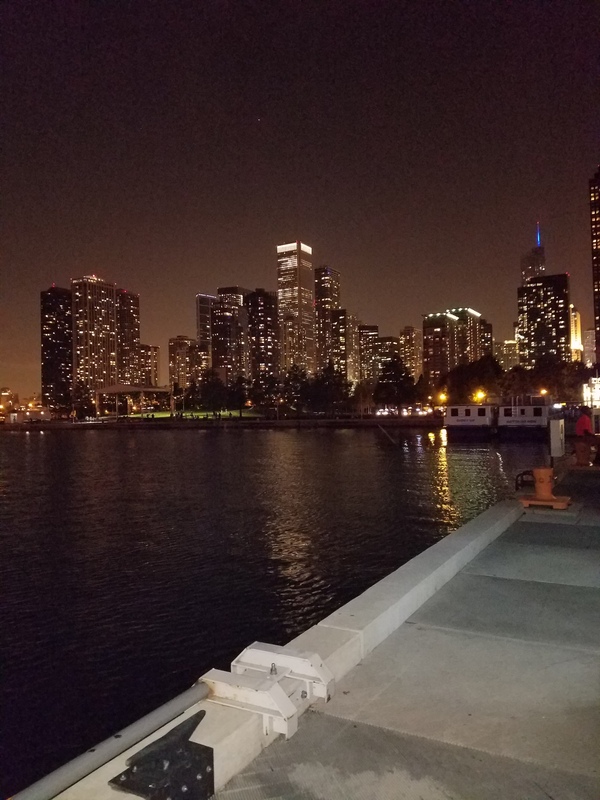 The Windella Boat Tour was highly recommended to us and and I highly recommend it to you if you find yourself traveling to Chicago. 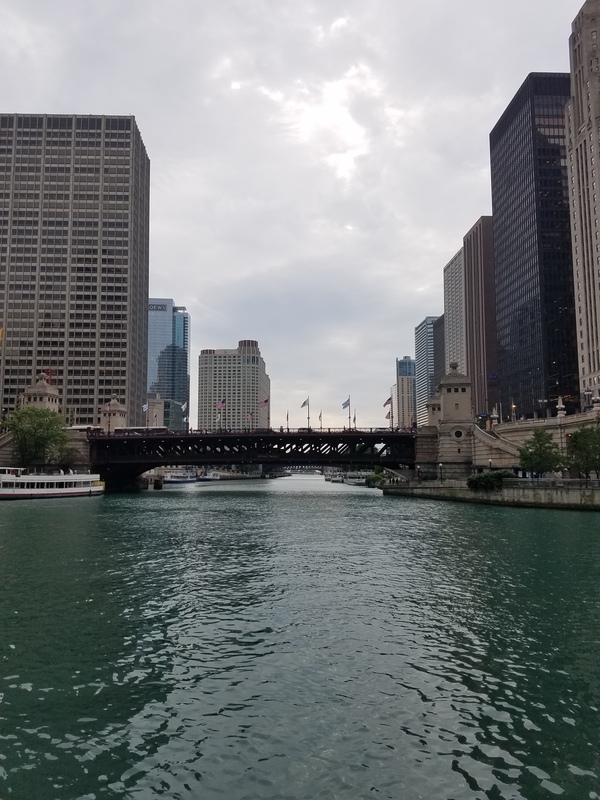 The tour took us along the Chicago River and many, if not all of the significant buildings, large and small, were talked about. Sounds boring, but it wasn’t! The way the guides mixed in interesting facts with the more informative ones worked well. We learned how/why the buildings were made, what they’re used for and which the guides think we should stop by while walking around the city. Overall, the boat tour was fantastic! What I wore on Thursday. The next stop after lunch that Thursday was the famous Cloudgate sculpture in Millenium Park, better known as The Bean. We got a little sidetracked though and ended up in the Chicago Public Library, which had beautiful architecture and the coolest rooms. 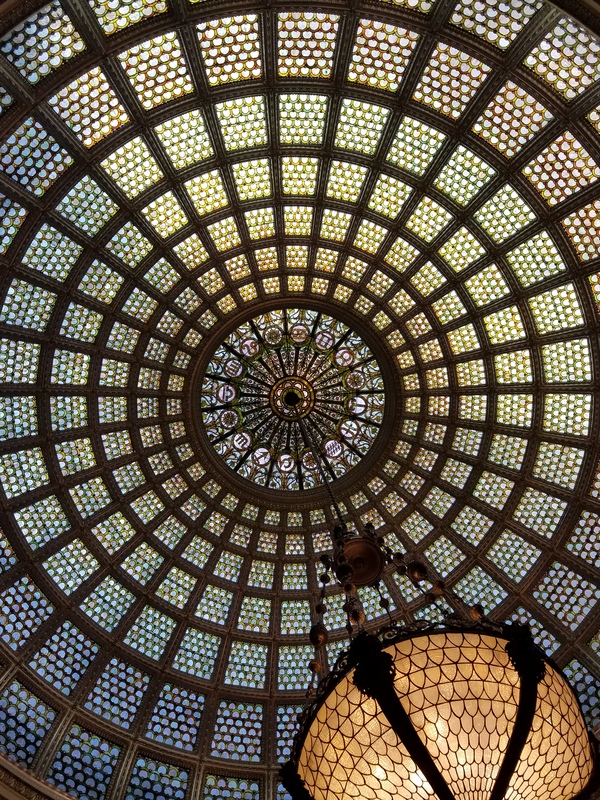 The beautiful dome on the top floor of the library. After being awestruck at the library, we finally made our way over to Millenium Park. This park was probably the most tourist-filled place we stopped in Chi Town and it would probably be best to go in the early morning when less random strangers would be there to cloud up your picture! The Bean is quite cool though and there are other sculptures and fountains throughout Millenium Park that you can stop at. 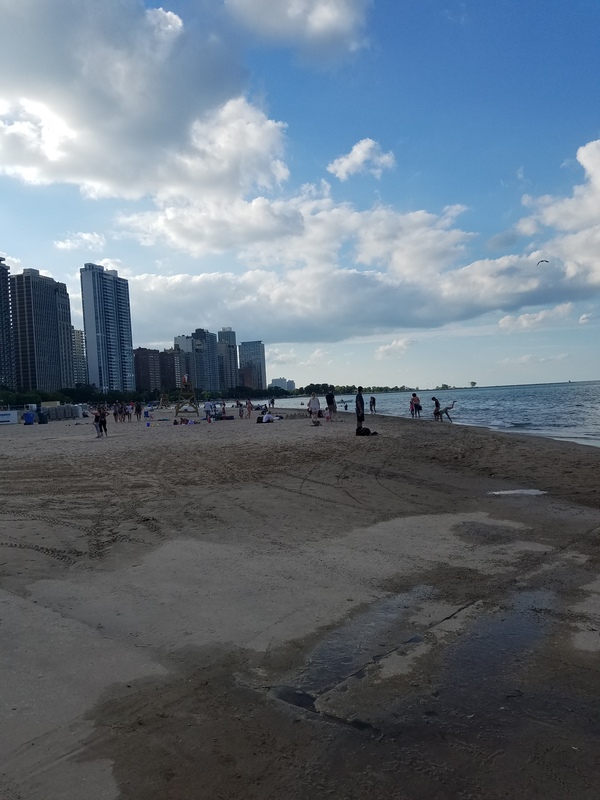 That afternoon, Chicago had heated up a but and my family decided to go back to the hotel for some chill time, before going to our next location: Oak Street Beach. We took an Uber, which was relaxing compared to the rest of the trip when we were walking fast, trying to keep up with the city natives! The beach bordered Lake Michigan and it was best, yet strange to be on a beach with a city skyline around it. We sat for a while and I worked on a blog post and enjoyed the nice Chicago weather (which is 20 degrees cooler than my home), sounds, and views. As we were getting ready to leave for dinner I took off my shoes and waded in the lake a little ways. It was much colder than the South Carolina waters I’m used to, but also a lot more refreshing! That night we ate dinner at Giordano’s, a deep dish pizza place. The wait was about 30 minutes and we had no idea you could pre-order (whoops), so once seated it was still an hour or more before food even touched our mouths! Nevertheless, my veggie pizza was extremely yum. Friday was sadly the day we were set to go back home, but we did stop at one more place before completely leaving Chicago behind. Wicker Park was mentioned to me through an instagram livestream I was watching and I’m glad I took the recommendation. It was just a quaint street right outside of Downtown Chicago with many unique shops and eateries. I stopped into Free People, Emma, and a pop-up shop called Garage. Everything opens at 11 am and I do say this a great place to go for a quick, but still fun, break from the city. A mural in Wicker Park. Every vacation with my family during the summer is always a good time, and this trip was no different! I learned a lot, bought some new clothes, ate wonderful food, saw pretty sights and got to spread my horizons by traveling away from home. I’m hoping next year’s trip will be just as great and feel free to leave down in the comments where you’ve been this year and/or where you’d like to go sometime in the future. As always, thanks for reading! 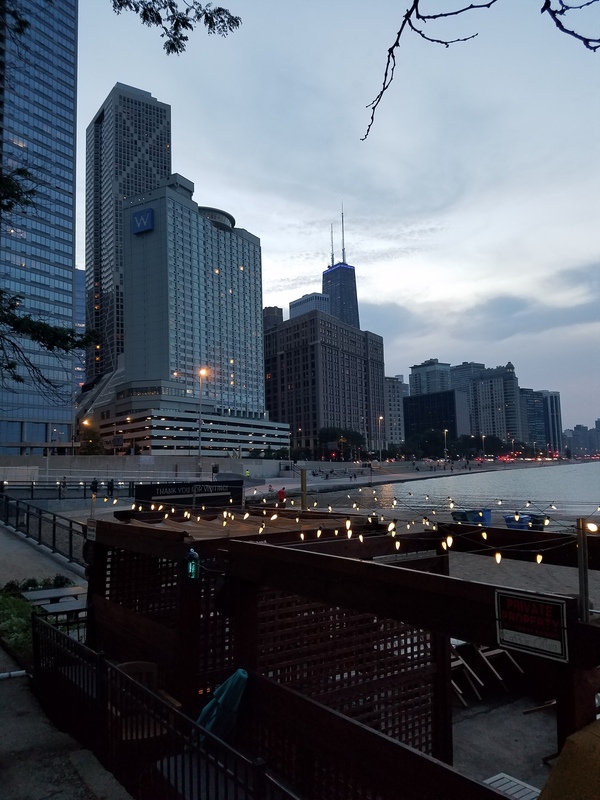 Chicago…one of my favorite cities! I too, love the architecture in the Library. And the boat tour is awesome! Thanks for sharing. Chicago is so so cool! Thanks for reading. Chicago is one of my all time favorite places! I’m glad you had such a great time & your outfits were so cute! This trip sounds so fun, I’m jealous! Chicago is definitely a place I would like to live in, because it seems like there’s so much to do and see there! Btw, great post it was really interesting to read! Yeah that’s true, Chicago does have some pretty cold Winters, but compared to where I live (which is Michigan) it might be ever so slightly better. 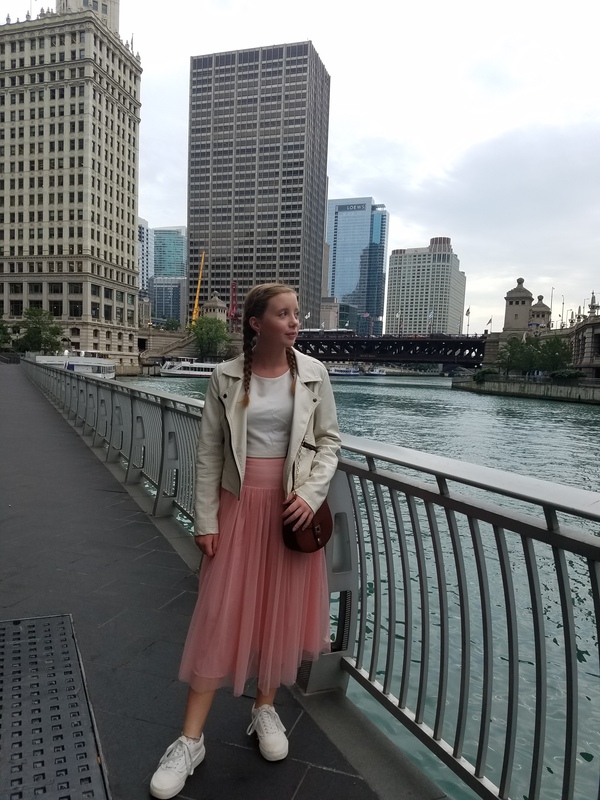 I’m planning a trip to Chicago in the Spring so this post was very helpful in giving me ideas about places to stop by! I’m also a vegetarian so that’s cool too!! Yay!! I’m so glad it helped you out and its cool that your a vegetarian too! There were lots of restaurants and food options for vegetarian in Chicago, so hopefully you’ll find some yummy food! Aw I hope you get to go one day! I know for sure you’ll love it! Thanks for reading! I love your skirts they look so nice! Chicago seems like an aweosme place to visit. I love both your skirts they look so nice! Chicago looks like an awesome place to travel to. Aww I feel ya girly 😂 Thanks for reading! Great post Olivia! I’m looking forward to visiting Chicago in a couple of weeks!